The naming of the new authority to run Africa. 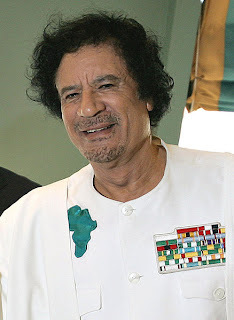 Col Gaddafi demanded that he should be given the title: “king of kings’’ but his colleagues refused. There was no agreement on the nature of portfolios to be created. Col Gaddafi was recently elected by the heads of state of the 53-member union behind closed doors at a summit in Ethiopia. "I shall continue to insist that our sovereign countries work to achieve the United States of Africa," he said in his inaugural speech. The chairmanship of the African Union is a rotating position held by heads of state for one year. Apparently, this year it was the turn of a North African leader to chair the bloc, and what do you know - Col Gaddafi was the only one present. Which works out just perfectly! He could not remake the Arab world in the 1990s, so the beginning of the new century must start with a new project - the unification of the African continent into the “United States of Africa.” And who else but the Leader and Guide of the Revolution and longest-serving head of government in the world have the guts to do this? Tantrums are temporary setbacks. Don’t worry, he’ll be baaack.